We may have Infinity War in the rear view mirror finally, but the year is still full of superhero movies of different stripes. Of course we have Deadpool 2, Ant-Man and the Wasp, Venom, and one that could be the most enjoyable of the bunch is the animated Teen Titans GO! To The Movies, which looks to skewer the comic book world worse than Ryan Reynolds' mouthy mercenary. 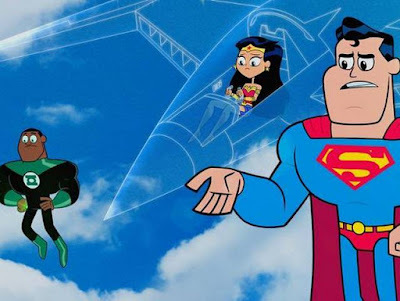 The film reunites the talented voice cast from the beloved cartoon series, while adding Kristen Bell as Jade, Will Arnett as Slade "Deathstroke" Wilson, Halsey as Wonder Woman, Lil Yachty as Green Lantern, and Jimmy Kimmel as Batman. But wait...how can you have all of those characters but no Superman? Of course he makes a cameo in this, too, voiced by Nicolas Cage who finally gets to play the Man of Steel after that failed movie with Tim Burton years ago. There are two moments I love in this footage. The first is right off the bat as Robin mistakenly thinks they're making a movie about him, but it turns out to be an Alfred action flick. The second is when the team tells Slade he must be Deadpool which drives the villain nuts. Deadpool creator Rob Liefeld totally copied his design (and name, Wade Wilson/Slade Wilson) from Deathstroke because that's pretty much all he did in the '90s was copy others. Ok, I also love that even the animated Green Lantern doesn't want to talk about that terrible live-action Green Lantern movie. Teen Titans GO! To The Movies opens July 27th.